Sayyy Whaaaa? A second post in one week *gasp* ...I know! I haven't done this in a while. The thing is that I am definitely trying to be a bit more consistent and organized with everything. I want to be able to talk to y'all more and about other things besides just music. Also, thanks to Courtney and her post "How I Plan for Blogging" I was inspired to actually start using a planner, I know *gasp*. I am not the most organized person but here I am, so far it seems to be working. Let see how long it lasts. Quick Question, who remembers when "Notes" were used in Facebook? You know, it was a section where you were able to write really long stories, questionnaires to share with your friends? I really enjoy writing,but somewhere through the years I stopped doing. There was something special about sharing your thoughts in a way that hopefully others could relate.I even joined HitRECord. The collaboration site ran by Joseph Gordon Levitt, where everyone works together to create awesome, imaginative things.Although, I never understood how to properly get my "Tiny Stories*" involved in actual collaborations. I've only shared a couple of my own with friends. Today I have decided that I will share some of my favorites with you. *Tiny Stories- are defined as just that, Tiny stories. It could be a poem or a short story. It is our memories that I dream of. then you turned around and laughed at my innocence. what it was about you that took control of my heart. gives me the most comforting feeling there could ever be. May 2, 2013 - So I was brushing my teeth before heading to CFM, when my roommate told me that I had a package in our porch. Figured it was weird since I hadn't ordered anything...but the package was addressed to me, I opened it and these two precious little things were in it. I started crying and drooling toothpaste...but it clicked who this could be from, Christian ....thank you!!! These are just a few, I have more. Some that are a bit longer. Those would be more of Long Stories...hahaha...lame joke. Hopefully, I can get back in the grove of things and start writing again. One day, My Tiny Stories will one day make it into "The Tiny Book of Tiny Stories" even if it is in Volume 50. Writing still makes me smile, what hobbies do you have that make you feel like that? Do you share them with others? It is crazy how everything changes so fast, in the internet world. Oh neat! I didn't know Joseph Gordon Levitt ran a site! Thanks for sharing :) Those Tiny Books look adorable! Yeah I found out about a few years ago. He started it with his brother before he had passed, it was their special project. Now he has a TV show that I believe is on Netflix. 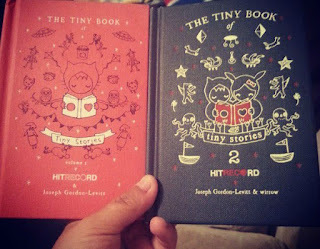 The books are adorable and the stories are always short, but special. I am happy my friend gave them to me.